Our exclusive design Tissue Box Covers are the perfect addition to any home, shop or office. A fun and easy way to add colour, style or a more professional look to any room, these Tissue Box Covers also make an excellent gift. Made from durable 3mm thick acrylic (Perspex), our Tissue Box Covers fit over common tissue boxes up to (L)22cm x (W)11.5cm x (H)10cm. Available in a huge variety of colours, these unique, modern Tissue Box Covers are sure to compliment the décor in your home, office, salon, or boutique. Now also available in Superhero Theme and Footy Team Colours, they are the perfect fun gift for footy or comic book fans, and the ultimate addition to your man-cave! Stylish and functional, our Tissue Box Holders are stable, protective and keep unsightly tissue boxes hidden and in place. Simply place cover over the tissue box! All ready-made tissue box covers are available to purchase for $26.00 each from our eBay store. Custom colour combinations can be made to order. 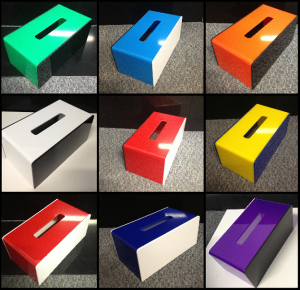 Please contact us on 1800 833 902 or email plastics@pacwestcorp.com.au to enquire about custom made tissue box covers, or to place an order.